Ministers say they are not crowing or complacent about the latest council tax rises. But it is easy to imagine the clinking of champagne glasses in Whitehall for, if these figures show anything, it's the power that government capping has to concentrate town hall minds. Last autumn ministers made it clear they wanted rises below 5% and wouldn't hesitate to cap authorities that strayed above. The medicine worked. This year's average increase - 4.2% - is the third lowest since the council tax was introduced in 1993. Only a few councils, including the counties of Cornwall and Cumbria, have dared go to 5%. They might be gambling that no minister would force councils to issue lower bills over an increase just one tenth of one per cent above the cap limit. Some police authorities, though, are chancing their arm a little more. Lancashire are putting up their police precept by over 11% and Durham by over 34%. At local level, all three main parties are deeply opposed to capping. It robs councillors of the freedom to charge council tax payers what they believe is needed to fund decent local services and then answer for it at the ballot box - the essence of what local democracy should be about. I suspect, though, that many council tax payers would be furious if ministers abandoned their power to protect them against high increases. So far the government has just about contained public anger over the council tax but it knows bigger battles lie ahead. 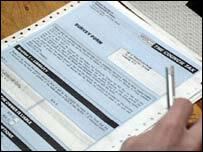 In Devon nearly 100 pensioners have withdrawn their final payments for this year. The campaign group Is It Fair? says there are smaller pockets of resistance elsewhere. They are not on a scale anything like the poll tax protests, but they do signal growing despair about above-inflation increases eating away at pensions. Next month we'll get the long-awaited results of the Lyons Review on local government reform. The author, Sir Michael Lyons, is under strong pressure to make the tax more progressive, perhaps by adding more property price bands so that the most expensive homes pay more and the cheapest less. There are strong hints too that he will recommend a big shake-up of council tax benefit, making it easier to claim and possibly more generous. Amazingly, there are still up to 2.9 million people in Britain who are eligible for help with their bills, but are not claiming it. But what Lyons recommends and what the government will do may be very different. As the likely new prime minister, would Gordon Brown really want to embark on a root-and-branch reform of local taxation and create large numbers of winners -and losers? The best bets are on a tinkering with the current system of council tax. But that will inevitably mean going ahead with the revaluation of homes which the government postponed. It is another big hurdle on a path already strewn with political obstacles.